This is a really cool series going on over at Sarah's blog right now. A whole bunch of different bloggers are sharing their thoughts on a lot of different topics. I"ll be making an appearance over there sometime in the next couple weeks. Pop over and see what's going on now if you are interested! Amy posted about this site on Monday and oh my goodness it is so funny. It is also just really cool to see how you can make it look like someone is saying something completely different than what they are actually saying. I really want to make myself a few shirts with a cute collar. 2. 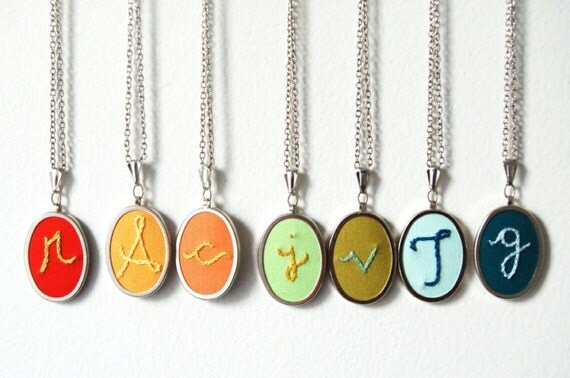 Merriweather Council embroidered necklaces. The necklaces are super adorable and I love the colours that Danielle choses for her photos as well. So pretty! I love this so much and I am also super impressed with anyone who knits themselves something wearable. I tackled an afghan but clothing still makes me nervous. I can't even tell you how many sweaters I have started and then given up on! You are the best Meredith! Today I plan on working on a dress that I started yesterday. I finally cut out some fabric that I have had for so long but was never sure what I wanted to make with it. I'm excited to finish! I love the Peter Pan collar! Totally adorable and it is complements every average outfit. Good luck to your dress and happy sewing! Aaaahhh! The fawn-cho! I've been knitting for a couple years and can do hats, scarves, gloves, and blankets like a pro. I've been too scared to do anything really fitted like a sweater, though. This makes me want to start! Also, I actually just blogged about a dress I made with a peter pan collar. that part was pretty easy! Oh my goodness, that Bad Lip Reading site is killing me! The work day needs to hurry up and end so I can go home and start my weekend by watching every single video and laughing til I can't breath. We're so much alike! I'm guest posting on Sarah's blog as well. :D I have been lusting over an "a" necklace from Merriweather for a month now and I ADORE Meredith AND her fawn-cho! 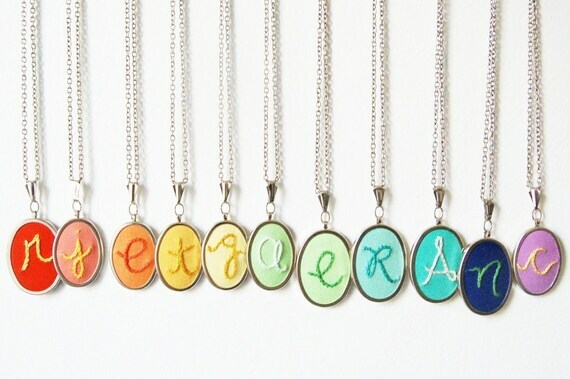 those initial necklaces are sooo cute! !